Charles Curtis Adams married Jessie Callin. Charles Curtis Adams was born in 1888 at Suffield, Hartford Co., CT. He died on 13 August 1949. Jessie Callin married Charles Curtis Adams. Jessie Callin died in November 1972 at Hartford, Hartford Co., CT.
[S284] Courant, 12 August 2003. [S182] Social Security Death Index (on-line), Ancestry.com, SSDI, Ancestry.com, SSAN 046-38-3855. Matthew Leahey married Minnie Adams. Charles Richard Holcombe was born on 31 July 1940 at Hartford, Hartford Co., CT.2,3 He was the son of Harold Holcombe and Elizabeth Leahey. Charles Richard Holcombe died on 11 February 2015 at West Suffield, Hartford Co., CT, at age 74.4 He was buried at West Suffield Cemetery, West Suffield, Hartford Co., CT.
Charles R. Holcomb, 74, of West Suffield passed away Wednesday, February 11, 2015. Born in Hartford July 31, 1940 to the late Harold and Bessie (Leahey) Holcomb. He is survived by his wife of 49 years, Dorothy (Landers) Holcomb of West Suffield; a daughter, Susan (Holcomb) Kipp and her husband, Timothy and two grandsons, Wyatt and Austin Kipp all of Fallston, MD. Charles was predeceased by his son, David Holcomb. He also leaves a brother, Harold Holcomb of FL and many nieces and nephews. Charles retired from Hamilton Standard after 30 years working with space suites and the space toilet. He worked with Kaman Aircraft Co. many years as well. He belonged to the Antique Automobile Club of America, the NRA, DFAW of Windsor, and the Masonic Composite Lodge # 28 in Suffield for 50 years, the Suffield Historical Society and the Quinebaug Valley Engineers Association, Inc. He graduated from Hartford Technical School, after school he joined the U.S. Air Force Reserve during the Vietnam War. His love was antique cars and traveling both in the US and abroad. His family will receive friends Tuesday, February 17, 2015 from 6-7 PM with a Masonic Service at 6:40 PM at Nicholson & Carmon Funeral Home, 443 East St. N. (Rt. 159), Suffield. Funeral services will be held at 7 PM at the funeral home. Burial will be in West Suffield Cemetery, West Suffield in the spring. In lieu of flowers donations may be made to: Suffield Historical Society, 232 South Main St., Suffield, CT 06078. [S180] Compiled by Richard C. Roberts, Roberts Reunion, Page 37/Item A51. [S606] Richard C. Roberts, Roberts Reunion 4, page 95. [S818] Edwin W. Strickland II, William Buel, 8-14, page 580. [S284] Courant, online, February 14th, 2015. Justine Olga Schlosser was born on 14 April 1913 at New Hartford, Litchfield Co., CT.2 She was the daughter of William Robert Schlosser and Margaret Louise Tripp. Justine Olga Schlosser married Karl William Koch on 13 July 1935 at New Hartford, Litchfield Co., CT. Justine Olga Schlosser died on 2 May 1997 at Village of North Granby, Granby, Hartford Co., CT, at age 84. Justine (Schlosser) Koch, 84, widow of Karl W. Koch, died Friday (May 2) at her son's home in North Granby. She died after a brief illness. She was a lifelong resident and friend to New Hartford. Mrs. Koch was born April 14, 1913 in New Hartford, and was the daughter of the late William R. and Louise (Tripp) Schlosser. She was best known for her work as a public health nurse for New Hartford during the Flood of 1955, and later as a nurse at Winsted Memorial Hospital. The "Cookie Lady", she was a friend to all. She was a member of the North Congregational Church of New Hartford, the New Hartford Historical Society, and also enjoyed deep sea fishing. She leaves two sons, Robert F. Koch of North Granby, Mark A. Koch of Block Island, RI; two sisters, Margaret Pratt of Granville, MA, Dyllis Braithwaite of Barrington, IL; six grandchildren, eleven great-grandchildren, and numerous nieces and nephews. She was predeceased by a son, Karl W. Koch, Jr.
A memorial service will be Saturday, May 10, 1 p.m., at the North Congregational Church, New Hartford. In lieu of flowers, memorial donations may be made to New Hartford Historical Society. Funeral arrangements entrusted to the John J. Shea Funeral Home, 5 Steele Road, New Hartford. [S180] Compiled by Richard C. Roberts, Roberts Reunion, Page 38/Item A52. [S606] Richard C. Roberts, Roberts Reunion 4, page 96. William Robert Schlosser Jr. was born on 8 October 1916 at New Hartford, Litchfield Co., CT.2 He was the son of William Robert Schlosser and Margaret Louise Tripp. William Robert Schlosser Jr. died on 21 June 1967 at New Hartford, Litchfield Co., CT, at age 50. He was buried at Silver Street Cemetery, Granville, Hampden Co., MA. [S180] Compiled by Richard C. Roberts, Roberts Reunion, Page 38/Item A53. [S606] Richard C. Roberts, Roberts Reunion 4, page 97. Dyllis Jane Schlosser was born on 21 July 1927 at New Hartford, Litchfield Co., CT.2 She was the daughter of William Robert Schlosser and Margaret Louise Tripp. [S180] Compiled by Richard C. Roberts, Roberts Reunion, Page 40/Item A56. [S606] Richard C. Roberts, Roberts Reunion 4, page 100. [S182] Social Security Death Index (on-line), Ancestry.com, SSDI, Ancestry.com, SSAN 027-30-6990. August Hansen was born at Denmark. He married Christina Everson. August Hansen died in 1928 at Granville, Hampden Co., MA. Christina Everson died at Granville, Hampden Co., MA. She was born at Denmark. She married August Hansen. [S606] Richard C. Roberts, Roberts Reunion 4, page 104. [S182] Social Security Death Index (on-line), Ancestry.com, SSDI, Ancestry.com, SSAN 025-14-3619. Rita Hansen Tripp was born on 13 May 1923 at New Hartford, Litchfield Co., CT.2 She was the daughter of Robert Holcomb Tripp and Mabel Augusta Hansen. [S180] Compiled by Richard C. Roberts, Roberts Reunion, Page 43/Item A63. Morton Hansen was born on 27 October 1858 at Gaidelberg, Denmark. He married Karen Marie Peterson on 24 August 1889 at Granville, Hampden Co., MA. Morton Hansen died on 1 April 1936 at Granville, Hampden Co., MA, at age 77. Karen Marie Peterson was born on 29 December 1868 at Viele, Denmark. She married Morton Hansen on 24 August 1889 at Granville, Hampden Co., MA. Karen Marie Peterson died on 9 April 1959 at Westfield, Hampden Co., MA, at age 90. [S135] Judge Oliver Seymour Phelps Phelps Family, Vol. I:Pg. 196/Item 376. [S419] Carol Laun, Beneath These Stones, Page 59. James Eno Phelps was born on 26 October 1762 at Granby, Hartford Co., CT. He was the son of Abel Phelps and Mary Eno. James Eno Phelps married Phylenda Rice. James Eno Phelps died on 10 September 1822 at Meigs Co., OH, at age 59. Additional information on James and his family is from a family group sheet submitted to the Phelps Family News, vol 12, No 12, May 1999 by Maxine Grothouse. Ms. Grothouse cites Pioneer History of Meigs Co., Ohio. [S135] Judge Oliver Seymour Phelps Phelps Family, Vol. I/Item 1124. Phylenda Rice was also known as Philinda Rice. She was born circa 1770 at Granby, Hartford Co., CT. She married James Eno Phelps, son of Abel Phelps and Mary Eno. Dr. James Enos Phelps was born in 1793 at Granby, Hartford Co., CT. He was the son of James Eno Phelps and Phylenda Rice. Dr. James Enos Phelps died in 1847 at Brazoria, Ft. Bend Co., TX. The Roberts Reunion Association lists Phoebe's maiden name as Eagleson; they apparently had no knowledge of her first marriage. Phoebe Brown was born in 1884. She married John Hoyt Bean III, son of John Hoyt Bean II and Addie May Holcombe, on 2 June 1917. Phoebe Brown died in 1942. [S606] Richard C. Roberts, Roberts Reunion 4, page 107. [S182] Social Security Death Index (on-line), Ancestry.com, SSDI, Ancestry.com, SSAN 711-10-7205. Earl Harvey Bean was born on 24 October 1919 at Granby, Hartford Co., CT. He was the son of John Hoyt Bean III and Phoebe Brown. Earl Harvey Bean died on 10 November 1919 at Springfield Hospital, Springfield, Hampden Co., MA. [S180] Compiled by Richard C. Roberts, Roberts Reunion, Page 46/Item A70. [S180] Compiled by Richard C. Roberts, Roberts Reunion, Page 46/Item A72. [S606] Richard C. Roberts, Roberts Reunion 4, page 108. [S182] Social Security Death Index (on-line), Ancestry.com, SSDI, Ancestry.com, SSAN 049-05-1436. Eleanor Florence Rengerman was born on 5 July 1923. She was the daughter of William Rengerman and Adelaide Maria Bean. Eleanor Florence Rengerman died on 19 October 1932 at age 9. Owen Edmund Johnson was also known as Owen Edward Johnson. He was born on 10 August 1899 at Hartford, Hartford Co., CT. He was the son of John Edmund Johnson and Emma Elizha Goslee. Owen Edmund Johnson married Nancy Gertrude Holcombe, daughter of Amos Roberts Holcombe and Ida Belle Cook, on 10 August 1920 at East Granby, Hartford Co., CT. Owen Edmund Johnson died in November 1978 at Hobe Sound, Martin Co., FL, at age 79. He was buried at Copper Hill Cemetery, East Granby, Hartford Co., CT; memorial stone only, ashes at sea. John Edmund Johnson married Emma Elizha Goslee. John Edmund Johnson was born in 1860 at Marion, AL. He died in 1903 at Hartford, Hartford Co., CT.
Emma Elizha Goslee married John Edmund Johnson. Emma Elizha Goslee was born on 9 November 1878 at Glastonbury, Hartford Co., CT. She died on 9 March 1958 at FL at age 79. [S180] Compiled by Richard C. Roberts, Roberts Reunion, Page 47/Item A74. [S182] Social Security Death Index (on-line), Ancestry.com, SSDI, Ancestry.com, SSAN 042-16-5082. [S180] Compiled by Richard C. Roberts, Roberts Reunion, Page 48/Item A75. [S606] Richard C. Roberts, Roberts Reunion 4, page 109. 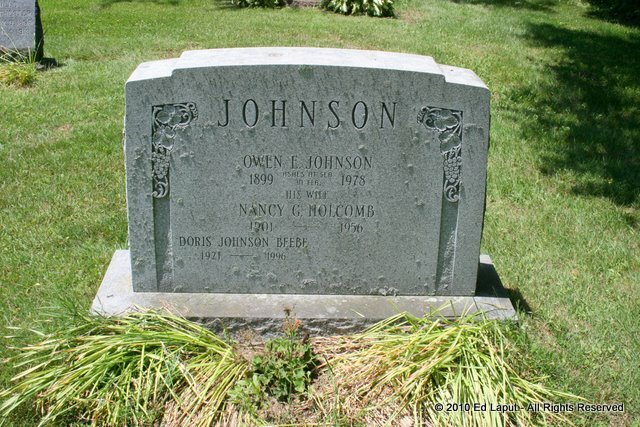 Owen Edward Johnson Jr. was born on 11 January 1942 at Hartford, Hartford Co., CT.2 He was the son of Owen Edmund Johnson and Nancy Gertrude Holcombe. [S180] Compiled by Richard C. Roberts, Roberts Reunion, Page 48/Item A76.